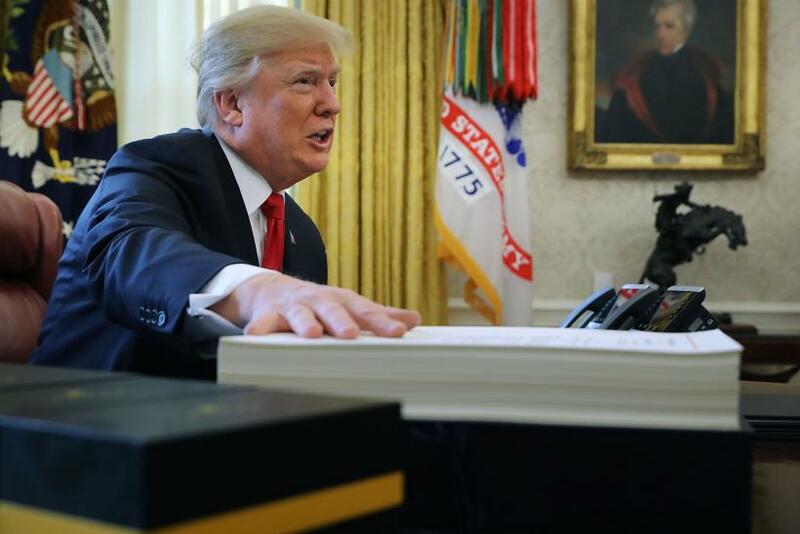 President Donald Trump on Wednesday wrongfully claimed he signed more number of legislation than former presidents did during their terms. Trump, while talking to approximately four dozen first responders at a firehouse in West Palm Beach, Florida, said, “You know, one of the things that people don’t understand — we have signed more legislation than anybody. … We broke the record of Harry Truman,” Politico reported. However, his claim turned out to be false. Trump signed the least number of bills into law when compared to any other president’s first year, dating back to Dwight Eisenhower, according to a report by GovTrack, a website that tracks bills in the U.S. The report further stated Trump signed the least number of bills (94) during his 336 days in office. That was eight fewer than former President George W. Bush and a long way off from Bill Clinton (209) and George H.W. Bush (242). Trump did not break the record of signing most number of legislation since his 101st day in office. The report came out a day before Trump signed the highly debated $1.5 trillion tax-cut bill. Even with the tax-cut bill and other impending major policies initiatives such as disaster relief and a legislative fix to Deferred Action for Childhood Arrivals, Trump will remain in last place in terms of the number of signed legislation unless there is some huge turnaround. According to the Politico report, Trump repeated his false claim to the firefighters and said his administration passed numerous legislation. However, the tax-cut bill, which was passed last week, was the first and the only major legislative success of Trump’s presidency up until now. Trump then thanked the firefighters for their service. This is not the first time Trump claimed something that was found to be incorrect. However, according to a report by PolitiFact, a fact checking website, the tax proposal which amounted to $150 billion to $220 billion per year, was not the biggest tax cut in the country. The report stated Trump’s tax bill was less than the American Taxpayer Relief Act of 2012 (enacted in 2013), which amounted to $321 billion per year. It was also less than the Tax Relief, Unemployment Insurance Reauthorization, and Job Creation Act of 2010, which amounted to $201 billion per year.